British and Spanish citizen. Born in London in 1939. Married a Spaniard and latterly lived in Spain. Has worked in various jobs, including as a teacher of English in Madrid. 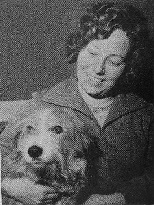 As with many pony book writers she penned her first book when very young, only about 14 or 15 years old, although she herself has admitted that her first novels lack a certain maturity. Her books are almost all about animals, with dogs and cats featuring as well as horses. The theme of them is usually the (often unhappy) lot of animals in a human world, with one human character tending to form a bond with the animal portrayed. The books are fairly uncompromising and often have scenes of animal cruelty. They have been labelled as 'sad' or even 'grim' books. But the author attempts to defend her work, explaining that her intent is "to show animals free from the sentimental light they are so often portrayed in fiction. I have not tried to write sad books as I have been accused of doing"
However, although the books indeed make sad and uncomfortable reading at times, they do usually have a happier ending. Many of her later books have a Spanish background and in them she has attempted to portray the Spanish attitude to animals which she is quick to point out is not cruelty but rather indifference. Her horse related novels tend to be about wild animals rather than the more traditional pony club setting. They are for the most part graced by the excellent illustrations of Victor Ambrus. Helen Griffiths is currently considered a "single author." If one or more works are by a distinct, homonymous authors, go ahead and split the author. Helen Griffiths is composed of 3 names. You can examine and separate out names.